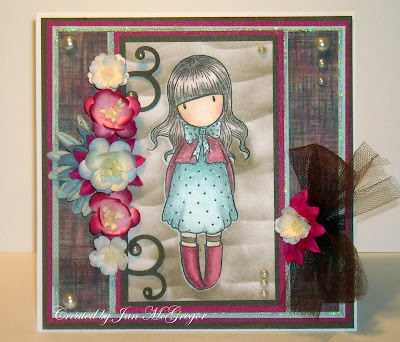 You can see that I've gone all moody with the colours...She is coloured with Copics..topped up with Polychromo Pencils..I masked the image and then cut a wavy piece of card and the stippled the background with Distressed ink..added some gorgeous WOC Flowers and super tulle Bow, pearls and sparkle..
My dark mood wont last long..I think its the weather really..oh I long for a holiday..but how things are at the moment..not sure I'll get away this year..
Awwww Jan hope you're feeling a little brighter very soon - the mood hasn't affected your mojo though - what a fabulous card and those colours are absolutely gorgeous. WOW GORGEOUS,love the beautiful detail!!! I hope you feel better soon!! Oh love your gorgeous card Jan.
Ohh what a pretty card :O) I just love the gorjuss girl so much <3 The colours are so nice together. I hope you'll soon feel better again.